Grandmaster Sergey Shipov is providing live commentary on the games from Bilbao at the Crestbook website. In today’s game you couldn’t knock Magnus Carlsen for trying, but his attempt to outwit Vishy Anand in an endgame ended in disaster. As if that wasn’t enough the World Champion also regained the no. 1 spot on the live ratings. Shipov’s original commentary in Russian, with a board you can click through all the analysis on, is at Crestbook. Greetings, dear spectators! This is Sergey Shipov, an expert from the www.crestbook.com website, here to commentate on selected games from the super-tournament in Bilbao. Today we’re going to look at the encounter between the World Champion and… one of his possible successors. Yes, Carlsen isn’t in the best of form, but there’s no doubt about his general promise. The future belongs to the Norwegian youngster. But at the moment he’s having a tough time. In similarly tight tournaments anyone who shows weakness comes, as a rule, under the heaviest of pressure from the other predators who smell blood. Beating the outsider and not losing to your competitors is the most sensible strategy. And if the outsider (i.e. the person out of form) is identified, then you have to attack him with either colour. Even with black, if the opening goes well. 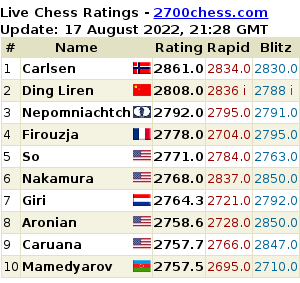 Logically, Magnus now has to play more solidly, reliably. But that’s just a general, abstract recommendation. In chess it’s important to act according to the position, taking decisions based purely on the chess circumstances. If, after the opening, you get a situation (perhaps unexpectedly) where to achieve a positive result you need to be active, then there’s nothing you can do about it. You have to attack! Boldly, forgetting past failures. For which you need character. Will-power. A flexible nervous system. I think Carlsen’s got all of those. He can take it. 1. e4 e5 2. Nf3 Nc6 3. Bb5 The Ruy Lopez. 4. d3! Rejecting the endings we’ve seen ad nauseam! In which, by the way, theoreticians are at a loss against black’s impenetrable wall. Look at N games on that theme from the Olympiad in Khanty-Mansiysk. 4…d6 5. 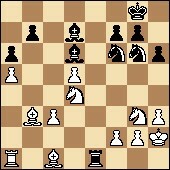 0-0 White calmly develops, leaving opening the centre until later. 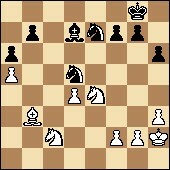 5…Be7 A modest but very reliable move. Putting an obstacle in the path of white’s attempts to seize the centre. 9. Nf1 Again discreetly holding off from complications. 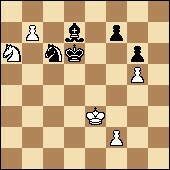 9…Bf8 The e8 rook joins the struggle for the centre. 10. Ba4 The bishop hides from dangers i.e. from possible exchanges, as the exchange of minor pieces really does favour black, the side with limited space. 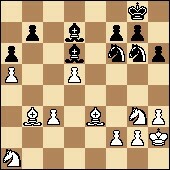 Hence white’s strategy: to apply pressure, while not yet entering into the clinch. 11. Ng3 We’ve returned, by a different move order, to known positions. There’s nothing new yet. By defending the e4 pawn white again makes the d3-d4 push a possibility. 11…Ne7 Played according to Aleksandrov. The pawn rather than the knight goes to g6. 12…Ng6 The players’ cavalry has amicably relocated to the kingside. Soon raids on f5 and f4 should follow. 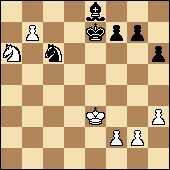 13. d4 The logical conclusion of the opening rearrangement. White, after all, puts pressure on the centre. 13…c5 This novelty is no small wonder. Weakening the white squares like that in the centre! But turn on your computer and it’ll explain everything. Chess programs recommend the move. It seems that Vishy… no, he hasn’t trusted it. But he’s checked the computer idea. And recognised its quality. 14. h3 An extremely cold-blooded response. White isn’t tempted to move the d4 pawn. It’s as if he’s saying, let black exchange on d4 and leave himself with a weak pawn on d6. 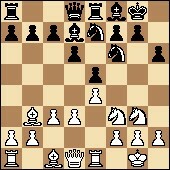 14…Qc7 Both sides are skillfully strengthening while maintaining the pawn tension in the centre, for now. Black’s position is crying out for some pawn aggression on the queenside. 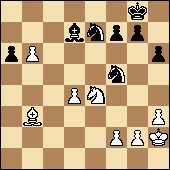 15. a4 Magnus prevents it. And at the same time… or perhaps first and foremost, fights for control over the white squares. 15…a6 Vishy sticks to his guns. The b7-b5 move is again on the agenda. 18. Nxd4 And there’s what I was talking about in the introduction, that striving towards solidity. 18…d5! A move that’s very well-timed and, without a shadow of a doubt, was calculated in advance. The centre of the board is completely cleaned out. The black pieces are released. White is a little behind in development. The rook on a1 is out of play for now. 21. Qc3 A bold response. The check on the first rank won’t be fatal. It’s interesting, though, whether Magnus has seen the strange, intricate lines where the black knight is sacrificed on g4 and the white king comes under a whole serious of discovered checks? 21…Qxc3 There’s no reason to avoid exchanges. The tempo for the attack is more important! 22. bxc3 Re1+ And now after the white king goes to h2 black plays Ng6-e5 with the idea of Ne5-g4+! 23. Kh2 Well done, Kid! (Translator’s note – “Малыш”, a nickname Carlsen has on Russian forums) He’s gone for it. He’s decided to satisfy his chess curiosity. It’s as if he’s saying, so then, guv, what did you give up a pawn for? Vishy plays simply. But also strongly. Black’s initiative should be enough to win back the pawn. At least. 24. Nc2 A good defence. 24…Rf1 The rook doesn’t desert the front line. The g3 knight is a phantom. 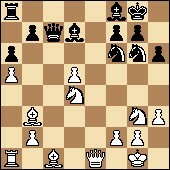 White has managed to exchange black’s most dangerous attacker. But he won’t manage to keep all his pawns alive. 27. Bd4 Exchanging black’s main consumer. 27…Bxd4 28. cxd4 Ne7 And there’s the meal. Material equality is being reestablished while white still needs to consolidate his pieces. It’s easier for black to play this apparently almost-equal ending. For now the clocks are fine: 0.27 – 0.34. 29. Nc2 Nfxd5 But was it a good idea to let the g3 knight into the centre? 30…b6 If Anand was me he’d write: a logical, but risky move. When the knight on d5 is under attack – that’s dangerous. When the pawn on b6 also ends up under attack at the same time – that’s doubly dangerous. There’s a risk of blundering some sort of tactic… For example, 31. Ne3 with the idea that on 31…Nxe3 you can reply 32. axb6! But, it seems, everything comes together for black in analysis! 31. Ne3 Correct! The calculations of veterans need to be tested. In action. A normal human desire to keep your pieces in one unit. And calculate less! 33. Nc5 It would be hard to underestimate white’s threats. But it’s also not worth overestimating them. Black won’t allow white to bring a new queen into the world. And here it turns out that there’s no immediate way of winning back the piece. If you immediately promote the pawn to a queen then black simply takes it, and then another white piece, ending up with an extra piece. And if you first exchange on c6 then the black bishop moves to b5 and hobbles the white knight – and the king sets off to take it. There are still four moves to the time control, and ever less time on the clocks: 0.09 – 0.17. White has to bring his king into the battle. 37…Ke7 38. Kf4?! The need to rush is beginning to tell. 38…Ne6+ The most unpleasant of surprises – the black knight is going to d8. To take white’s best pawn. The situation is becoming extremely unpleasant for Carlsen and his fans… A second loss in a row is more than likely. 39. Ke3 Ned8 40. Bxc6 You won’t come up with anything better. And so, the time control has passed. There’s time for coffee and serious thought. It’s still not possible to win back the piece by promoting the pawn. The one hope is a fortress – for the moment black can’t get to the white passed pawn with his king. However, let’s not rush to conclusions. We’ll start with a cup of coffee! While Carlsen’s thinking I’ll note a very important result: Kramnik has beaten Shirov and considerably pulled away from those chasing him… who haven’t yet been spotted. As he, Vladimir Borisovich, is the only one to have won. 41. h4 The idea’s right – to stand still and keep a lid on black. But it’s not clear that this is the right way to go about it. Black’s winning idea is to move the bishop to the f1-a6 diagonal, nudging white into promoting the pawn. So the move in the game, it seems, doesn’t hinder black’s plan. 41…Kd6 As far as the black king can go. Now it’s the turn of the bishop. The bitter truth is revealed by deep analysis. 42. g4 A move that’s no worse than any others. It’s against the rules to do nothing. And it’s too early to resign until your opponent has demonstrated the win. 42…Bd7 The bishop will go via e6 to c4. The roadblock on f5 is too late. 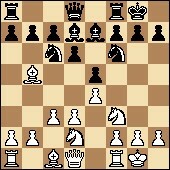 Moreover, the pawn on g4 is hanging. 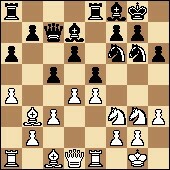 43. g5 hxg5 44. hxg5 Slightly fewer pawns on the board, slightly greater hopes of survival. Or illusions. A solid strategy. Now, in all lines, the black bishop supports and protects the pawn that’s going to be queen from the white king. 45. f4 All that’s left is the phantom hope of a dashing breakthrough – when the black pieces have been distracted by the process of taking the white knight. 45…Be6 And there’s the promised transfer. Besides, in the given situation the bishop could also go via h3 to f1. No, there’s still one not-very-convincing idea for white – to leave the pawn on b7 to its fate, return the knight to the centre and try to attack the black pawns. But I don’t believe in it. White shouldn’t be in time. He shouldn’t! And Magnus didn’t believe it either – WHITE RESIGNED! First of all, I want to note the bright, inventive and very energetic play of Anand. Today he was truly magnificent. 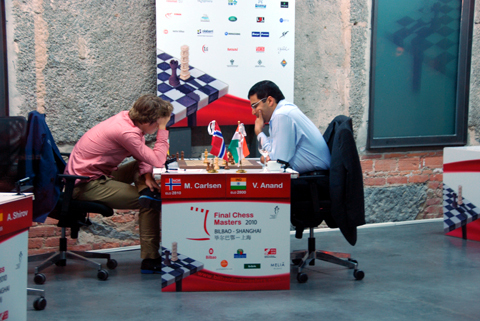 While Carlsen… Everything’s already been said about him. Even by the way he sits at the board (the video on the official site is working well) it’s clear how difficult he’s finding it to play. The kid needs a rest. There’s nothing else that can help him! But there are still four rounds to go. He’ll have to fight, to suffer – and hope for a miracle… Whiling away the evening with you, dear friends, has been Grandmaster Sergey Shipov. We’ll meet again tomorrow. All the best! Thank you for your hard work today. I hope it doesn’t detract from your enjoyment of the game. You are a talented translator. I know from experience that it isn’t easy, whatever languages are involved. Thanks! I must admit I sometimes feel as though I’m the person with the least idea of what’s actually going on in the games as I’m so busy trying to catch up with Shipov :) But the fact he makes things difficult with his flights of fancy is also what makes it worthwhile translating! Helo from Greece , great job mishanp!! Is it possible to make this available as a pgn somehow? It’s definitely something I want to look at doing… but I don’t think I’ll manage during Bilbao – for now the best option is probably to have the Russian original open at the same time: http://online.crestbook.com/bilbao10-02.htm And then you can play through the variations there. Actually, I just checked and probably a better option is the CBV file: http://www.crestbook.com/files/Bilbao-2010.cbv The text’s Russian, but if you have my English version open at the same time… A free download of Chessbase Lite would be enough to view the file.